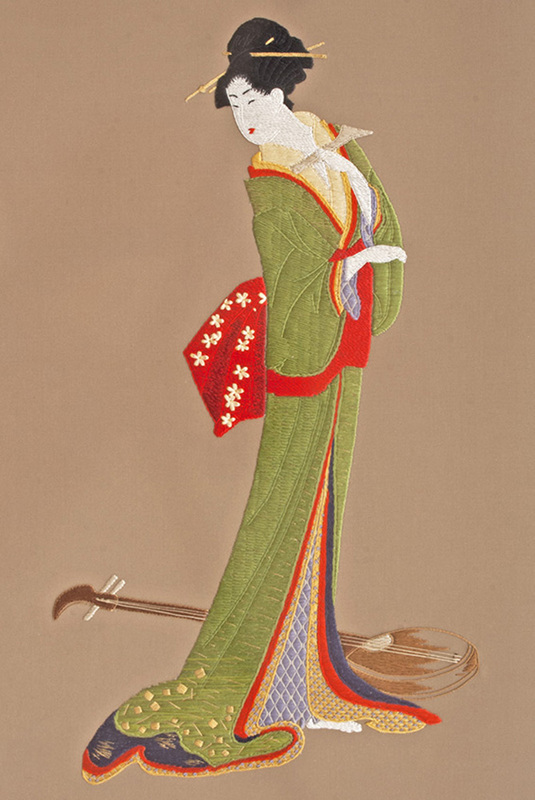 A Japanese Silk on Silk Embroidery using traditional Japanese embroidery techniques, after a woodblock print by Hosoda Eisha (aka Eisha Chobunsai), 1756-1829. I have always loved Japanese art, in general, and particularly woodblock prints. And if I had a favorite print, it would be this one, an iconic print of the 1800’s. So when I saw the Japanese Embroidery Center’s Phase 6 design, Eternal Grace, I was reminded of “Itsutomi” and decided to create a piece that reflected the print. Colors and fabric designs were collaboration between Mary Alice Sinton and myself and stitch instructions were provided by Mary Alice.